William Larymore, left, of the South Carolina Department of Natural Resources, and Salvatore Cirencione, of the State Law Enforcement Division, partially visible behind, help resident Franklin Bessemer, who lives on the river, back to a pier on the Waccamaw River in Conway, South Carolina, Sept. 17, 2018. Bessemer's boat had quit while he was checking on his home. Flash flood watches and warnings are posted from southern Virginia into Vermont and New Hampshire through Tuesday. Several tornadoes damaged buildings in the Richmond, Virginia, area Monday afternoon, with tornado watches posted for parts of Maryland, Pennsylvania and Delaware. Florence is now a what forecasters call a post-tropical cyclone, with top sustained winds of 35 kilometers per hour (22 mph). But the storm's slow speed as it approached the Carolina coast late last week allowed it to pick up a huge amount of moisture. 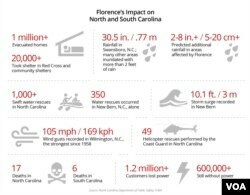 Authorities continue to worry about more floods, breached dams and landslides, particularly as Florence makes its way across mountainous regions. 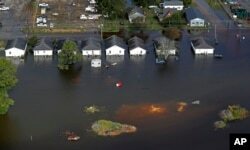 Floodwater from Hurricane Florence threatens homes in Dillon, South Carolina, Sept. 17, 2018. At least 20 deaths are blamed on the storm. “Unfortunately, we’ve still got several days to go. People fail to heed warnings and get out, or they get into the floodwaters trying to escape their home. And that’s where you start to see deaths escalate,” Brock Long, head of the Federal Emergency Management Agency, told U.S. television networks. Floods have cut off entire towns and cities in North Carolina, making helicopters the only way to get into these places and help the stranded. More than 700,000 homes have no power. 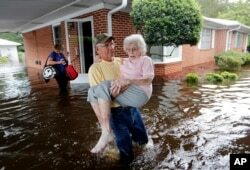 Bob Richling carries Iris Darden, 84, out of her flooded home as her daughter-in-law, Pam Darden, gathers her belongings in the aftermath of Hurricane Florence in Spring Lake, North Carolina, Sept. 17, 2018. One of the hardest hit cities in North Carolina was New Bern, a riverfront city not far from the Atlantic coast. Mayor Dana Outlaw said the city was hit by a three-meter (10 feet) storm surge at the height of the hurricane Friday. He said 4,200 homes were damaged.